Sydney, 17 October, 2017: Exablaze today announced the ExaNIC V5P, the latest addition to Exablaze's highly successful ExaNIC family of Network Application Cards. 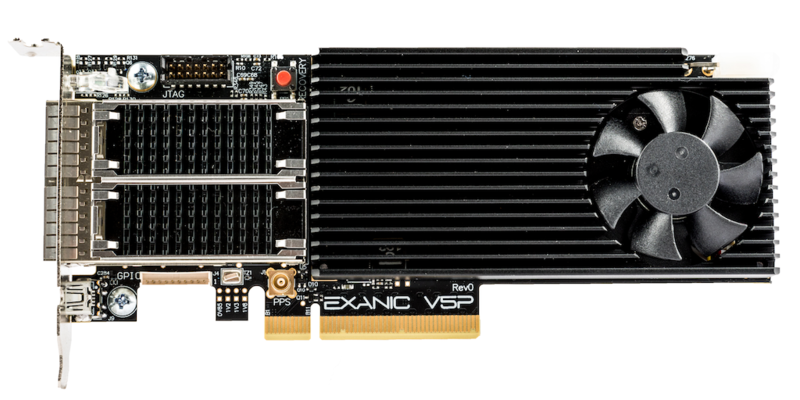 The ExaNIC V5P is a high-density FPGA acceleration adapter, designed for low latency networking, machine learning, and application acceleration workloads. Users will benefit from its high logic and port density, extensive memory hierarchy and extensive IP and software libraries. 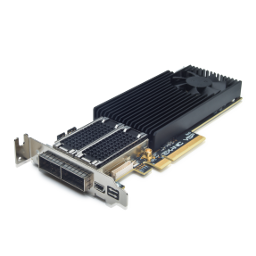 The ExaNIC V5P comes in an industry-standard low-profile (half-height, half-length) PCIe x8 form factor, suitable for deployment into any production server configuration. The card operates out-of-the-box as an industry-leading low latency network adapter, with no configuration necessary to 'bring up' the FPGA. The dual QSFP28 interfaces enable up to 200Gb/s of full-duplex operation, distributed over 8 independent ports for high port density that enables directly connected 'switchless' network applications. The ExaNIC V5P offers 3x higher logic density, and 9x more on-chip memory than any previous ExaNIC device. It is based on a powerful Xilinx Virtex Ultrascale+ VU5P FPGA with 132 Mbits of embedded UltraRAM and 36 Mbits of standard block RAM within the FPGA. The card also includes 144 Mbits of low latency QDR-IV SRAM and 9 GiB of DDR4 DRAM. This extensive memory hierarchy enables the development of memory intensive applications in a compact and easy to use form factor. For applications requiring a larger FPGA, the device is also available in VU7P and VU9P variants. An extensively tailored IP library ensures 'batteries included' rapid application development, while integrated PCIe based reprogramming and USB/JTAG debugging provide for hassle-free deployment. The Exablaze IP library includes ultra-low latency Ethernet connectivity for 1Gbps & 10Gbps (9.6ns PCS/MAC @ 10G) operation, a high performance PCIe DMA engine, low latency memory controllers, examples and starter design source code, and extensive integration into a full suite of Exablaze and 3rd-party software libraries (libexanic, exasock, ptp4l, etc. ).